God created the heavens and the earth, and all that dwell therein, and it was good. The Nabateans, however, are a close second. Working over two thousand years ago, this industrious tribe built Petra on what was already present in their land, fashioning the available landscape of canyons and ravines into a marvelous complex of buildings whose scale is almost beyond imagination. Working with natural openings and canyons in the sandstone cliffs, these people created stupendous feats of engineering to construct their city. The movement of water alone, which as you might expect exists, if at all, only in extremely short supply, is nothing short of genius. And of course, defense of the area, always a concern in those belligerent times, took a very different direction from the “seize the high ground” approach seen at Herod’s castle and at Karak. The Nabateans personify the concept of “location, location, location.” They constructed their civilization at the nexus of the major caravan trade routes (these ancients were on to something!). Rather than exacting tribute by force of arms, however, this society became enormously wealthy by catering to the needs of the caravans. Constructing a city that at its zenith counted more than 25,000 inhabitants, they became major suppliers to the caravans, allowing travelers to leave home without as many supplies as would otherwise be necessary to traverse the Jordanian desert. In addition, they managed to obtain a “corner” on the frankincense trade, becoming the exclusive providers of this expensive spice so necessary to religious worship of the time. The Romans tried, and failed, to conquer the city, and succeeded in eradicating this civilization only because they were successful in relocating the caravan trade routes such that they no longer passed near Petra. 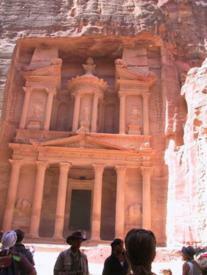 Paradoxically, the advent of Christianity also contributed to the demise of Petra as a viable civilization. Once the Western lands, including Rome, embraced Christianity, the market for frankincense bottomed out, and the city was left without a viable alternative product, and had no access to their former markets in any case. If business schools existed then, this would no doubt have been a classic case study. Petra today is a site that simply must be experienced to be appreciated. No amount of pictures or narrative can do justice to the sweeping grandeur of the area. In addition, the seeds of commerce are still alive and well there today, with Bedouin and Jordanian descendants of the Nabatean merchants very aggressively plying their merchant trades. Unfortunately, too many of the “treasures” that we saw for sale today in this jewel of a city had only recently had the “made in China” tag removed.